Programs are hands-on and last 90 minutes, including a PowerPoint presentation and time to create with well-planned, expert guidance. Maximum 30. All supplies and handouts are provided. Themes include Summer Reading, Seasonal, and Art History. Scroll down to see the drawing and painting programs currently available. Beginners are welcome for this modern twist on a classic silhouette portrait. Draw freehand or use one of the provided printouts. 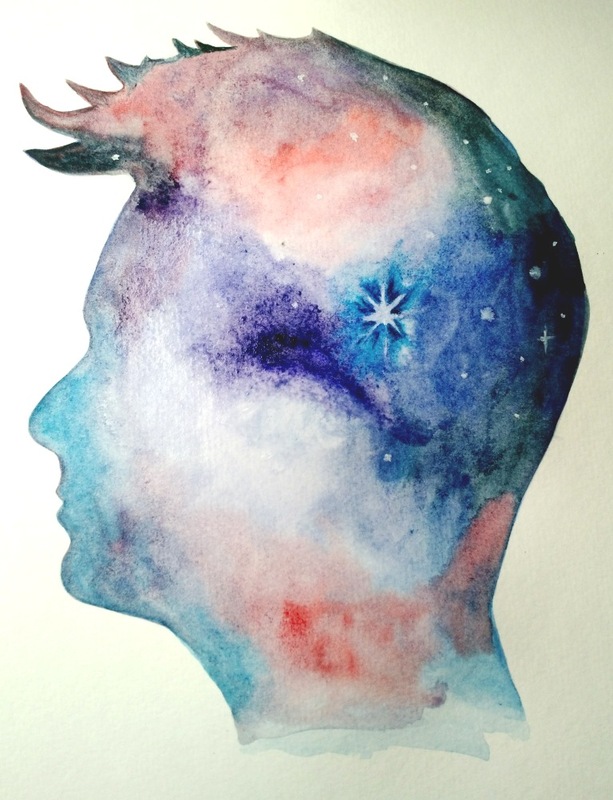 You’ll transfer an outline to watercolor paper, then Christine will teach you how to paint a galaxy pattern inside of your outline. Learn to paint this beautiful scene. Christine will teach you some fun, easy techniques using watercolor pencils, brushes, and stamping with plastic wrap. Beginners welcome! Beautiful white bark looks striking against the red and gold leaves of autumn. Learn to use watercolor pencils in this fun seasonal painting workshop. Christine will guide you through a high success painting process, first drawing with pencil and permanent marker, then learning to use watercolor pencils to add vibrant color to your painting. Beginners welcome! 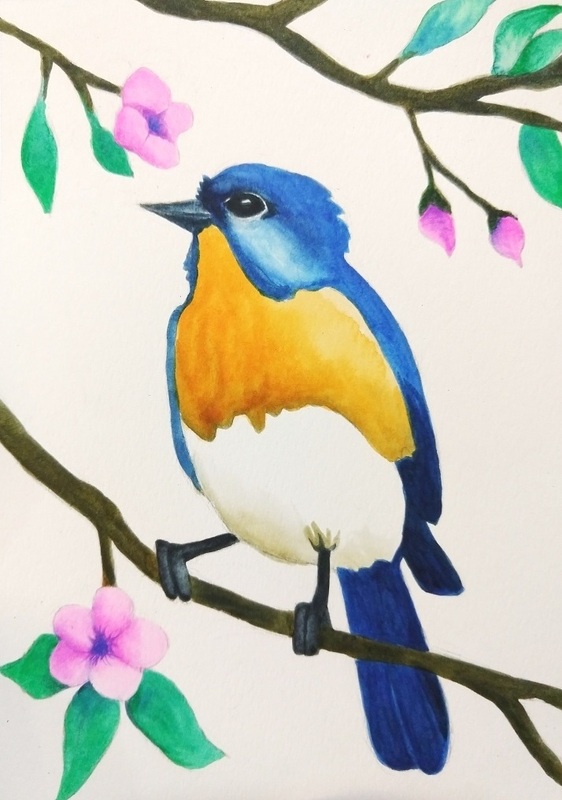 We’ll use liquid watercolors to create this beautiful image of an Eastern Bluebird perched among pink blossoms. The outline will be provided so you can focus on painting. Learn different watercolor techniques like wet on wet, dry brush, color mixing and more in this fun painting workshop. Beginners welcome! Learn to paint these beautiful flowering trees. Christine will teach you some fun, easy painting techniques using watercolor pencils, plastic wrap and brushes. Perfect for spring and Arbor Day (April 26). Beginners welcome! Beautiful, colorful butterflies will be the inspiration for this class. First we'll draw a butterfly on watercolor paper from photo reference and outline with permanent marker. Then learn to use watercolor pencils under Christine's guidance to add vibrant color to your painting. Colors can be realistic or inspired by your imagination. Beginners welcome! Pine trees, a lake and distant mountains unfold in this peaceful landscape. Learn to use some basic watercolor techniques like flat and gradated washes, wet on wet, dry brush and more. Then create your own beautiful landscape painting under the guidance of art teacher Christine Thornton. Beginners welcome! First Christine will teach you how to draw a cardinal using pencil on watercolor paper. Then learn to paint with watercolor pencils. Beginners welcome! Join us for this relaxing art program and get into the creative groove of abstract painting. Learn about artist Wassily Kandinsky and how music informed his paintings. Then Christine will teach techniques for painting to the rhythm of music like Kandinsky did using watercolor pencils. No art experience required! You’ll leave with a small finished painting. Come learn about the fascinating artist Gustav Klimt, and make your own painting inspired by his work. Art teacher Christine Thornton will teach you how to use metallic paint and colored pencils to create a beautiful tree of life on black paper for this fun, easy process. Beginners welcome! Perfect for "Women's History Month" in March! Learn about three popular female painters: Georgia O'Keeffe, Frida Kahlo and Mary Cassatt. Christine will start with a brief presentation touching upon the lives and art of these three fascinating women. Then you'll choose a reproduction of one of their paintings to copy in colored pencil under Christine's guidance. No art experience required.